Whether you have heard of them yet or not, Odd Squad members have been making a difference in our city’s most troubled area since 1997. A group of concerned Down Town East Side (DTES) beat cops decided to “take something out of that sordid mess that we were tasked with policing and make it positive” was how founding member and new Executive Director, Tobin Hinton, described the beginning. Operating as a charitable entity, the group does not receive any funding or financial support from the Vancouver Police Department and the contributors are made up of police officers, retired officers, and volunteers. This year’s annual Christmas fundraiser was held at Central City on Beatty Street and it was packed. The Odd Squad and the Police Judo Volunteers after a hard night of work! December 10, 2015 by toby hinton. The Law Enforcement Judo Association is pleased to announce the introduction of a Kamloops Police Judo program, commencing Sept 23rd, 2015. This program will run out of the Aberdeen Judo Academy training facility and will be managed by Police Judo Instructor Brad Endean. Brad has worked in law enforcement (Sheriffs) for over a decade. He has a long history with the martial arts, and started out studying various styles of karate over 25 years ago. Brad transitioned over to judo training several years ago under Sensei John Huntley and the Aberdeen Judo Academy. Brad is an assistant instructor at the Aberdeen Judo Jr. Program and he has two daughters involved in competitive judo under Sensei John Huntley. He has worked with the Police Judo Association for the past year in attending clinics, studying the training principles, working with the instructors and leading practices and clinics. Brad will be bringing a challenging, innovative and fun program of Police Judo to Kamloops. This program will be open for anyone interested in law enforcement, fitness, and self defence. The program is a recreational judo-based training program and will serve the community well in terms of offering reality-based training program that emphasizes the some of the same key principles Jigoro Kano established judo with: take care of your partner, and move forward together. Brad will be presented with his Police Judo Instructor black belt by JIBC Police Judo Head Instructor Al Arsenault on the inaugural Kamloops Police Judo class Sept 23, 2015. Kamloops Police Judo will be running every Wednesday night from 19:00-21:00 hours at the Aberdeen Judo Academy training facility. Please refer to the police judo website (policejudo.ca) or the registration page at http://policejudo.ca/judo-registration/ for more information. September 3, 2015 by toby hinton. Police Judo instructors are very pleased with the feedback from the recent seminar with Sensei Hiroshi Katanishi for higher level judokas! 100% of the participants who took the survey expressed interest in joining future seminars. This event was organized by Police Judo (Law Enforcement Judo Association) and Aberdeen Judo Academy, and sanctioned by Judo BC. August 30, 2015 by toby hinton. After graduating from Tenri University(Japan), Mr Katanishi becomes trainer of France’s National judo team. Mr Katanishi has assumed the technical direction for the last 30 years of the Judo Kwai Lauzanne in Switzerland. Mr Katanishi is also Dan Expert, Youth& Sports Expert for the Switzerland Judo Federation. Since 1999, He acts has technical advisor for the Switzerland National team. In 2003, he became the European Union judo expert. This seminar is for experienced judo members, blue belt and up and will cover a range of topics designed to improve judo techniques and and introducing new training drills and skills. Participants must be 18+ years old. • Participants will be required to sign a waiver as well as a Par-Q form prior to participating in this seminar. • There will be lunch presentations on both days. If not having the buffet lunch, please bring lunch! July 15, 2015 by toby hinton. Thanks very much for the generous spirit demonstrated by members from all three Police Judo clubs with the recent food drive for the after-school Yo Bro martial arts training program. This is a regular program that we are proud to be partnered with as reaching out and giving back is a part of the Police Judo martial arts culture. The youth that are involved in Joe Calendino's Yo Bro program have a real need for the donated food: they work-out hard, burn tons of energy and are in the growing stage of life. We will come calling for a bit of help again soon, but for now rest assured that every little contribution you have provided makes a difference. Below are a few photos of the food after Kyle made the deliveries. May 4, 2015 by toby hinton. The Law Enforcement Judo Association is holding a Takedown, Physical Control, and Handcuffing seminar. This clinic is open to anyone who is interested in learning effective and ethical arrest, control and handcuffing techniques. The participants will be instructed by three long term street cops. • Ret. Cst. Al Arsenault - Justice Institute of BC Police Judo Instructor, Author, "Chin Na in Ground Fighting", 27 years of experience in street-level policing. • Sgt. Toby Hinton - Simon Fraser University Police Judo Instructor, 25 years policing experience, profiled in "The Beat" reality series. • Sgt. Mark Steinkampf - Justice Institute of BC Police Judo Instructor, 24 years policing experience, profiled in "The Beat" reality series. *A maximum of 25 participants are permitted. April 26, 2015 by toby hinton. Congratulations to all of the members who graded for their hard work and effort this semester! The Police Judo Association will be sponsoring and hosting a higher belt seminar. This seminar is free of charge, and open to the members ranking green belt and above. There will be practice time on the mats to review techniques and training. Please advise the respective instructors of your club if you are attending. April 21, 2015 by toby hinton. Launa Hinton from SFU Police Judo / Abbotsford Judo will be fundraising for her trip to the Judo Junior Nationals in late May 2015 in Montreal. She will be selling police judo shirts over the next few weeks at all the Police Judo Clubs. The shirt is a good quality, long sleeve light grey sport shirt with the official "Police Judo" logo embroidered on it. The cost of the shirts are $25 each (XXL $27) and the sizes range from S to XXL. Whatever funds raised (a few dollars a shirt) will be put toward her travel costs. Launa will be taking orders and payment for the shirts. A bulk order will be placed and the shirts will be delivered to the respective clubs in several weeks. Any support for her fundraising is greatly appreciated! April 12, 2015 by toby hinton. "My first Judo class was tough but exciting,” reflects Brian Shipper, a longtime Judo practitioner and instructor with the Police Judo Association, an independent and non-profit judo organization that began in the VPD gymnasium on Cordova Street in the early 1990s. Tim Ladler is a former Sergeant with the RCMP and currently retired Inspector with the Vancouver Police Department. As the Club grew and attracted more members, both Tim and Brian noticed that the competitive one-on-one sparring sessions, called “randori”, were causing a significant number of injuries to the participants, many of whom were police officers who are required to be healthy in order to perform the rigorous duties of being a law enforcement professional. They both noticed that many of the new participants at the SFU Club were interested in new experiences and enjoyed the Judo workouts and philosophy, but were deterred by the competitive aspect. As a reaction to this, Brian and Tim began adopting a style of teaching Judo that focused on low-risk, high-yield techniques, many of which were practical to law enforcement professionals. Competitive “randori” was eventually omitted altogether, and was replaced with more cooperative drills that focused purely on improving one’s technique. The rest of the class revolves around learning techniques through the instruction of the many experienced and NCCP Coaching Certified instructors. “We focus on low-risk high-yield Judo techniques and we are fortunate enough to have many experienced instructors available who observe and encourage proper technique from all of the participants." 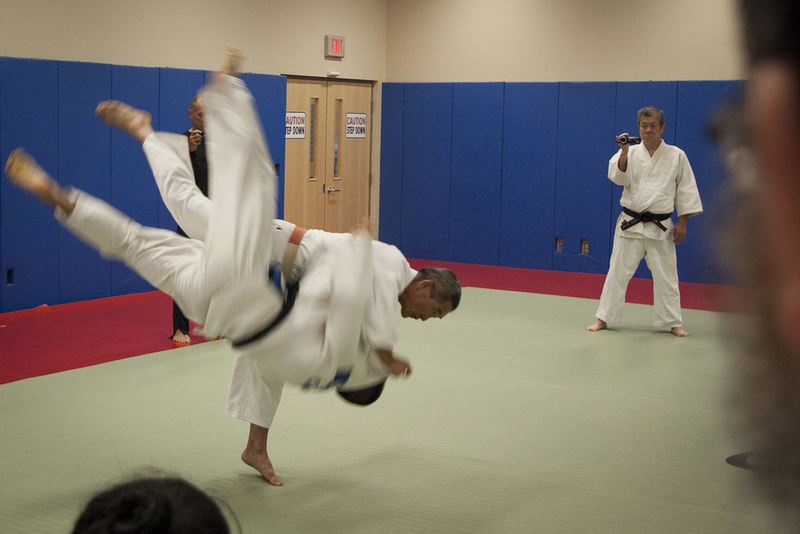 The Police Judo Club also goes beyond offering a recreational Judo program. For the past 3 years, The Law Enforcement Judo Association has provided a youth Judo program at the Ray Cam Community Centre. This program is managed by Police Judo black belt Yoon Choi, along with the assistance of other Police Judo Club volunteers. For the past five years, black belt member Chin-I Hsiang has co-ordinated and led the SFU Police Judo Junior programming which also includes an annual summer camp. 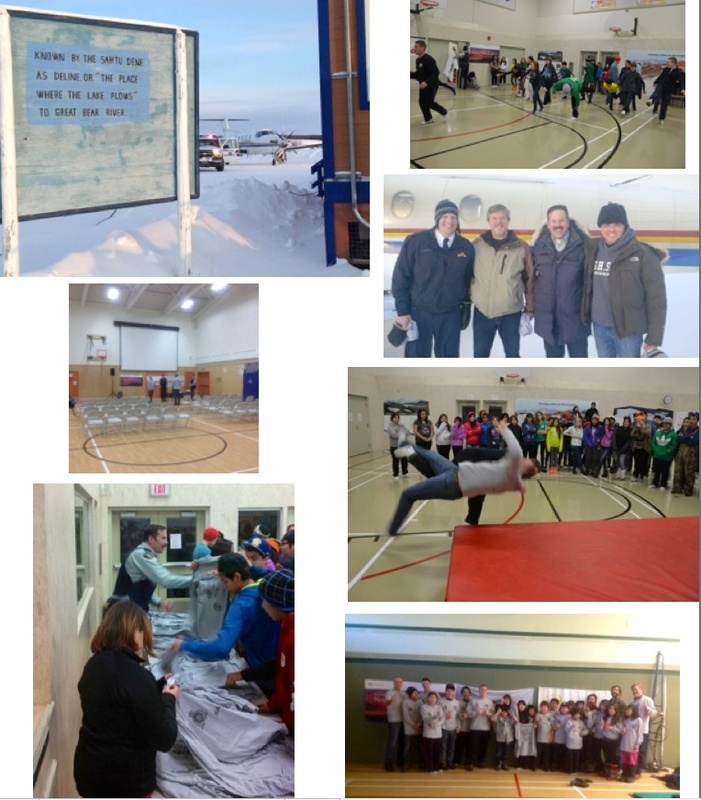 In addition to this programming, all three Police Judo Clubs support the registered charity, the Yo Bro Youth Initiative, with volunteers for programs such as food drives. In addition, Club volunteers assist Yo Bro founder Joe Calendino with leading martial arts based fitness classes for many at-risk youth. Whether you are entirely new to martial arts or have many years of experience under your belt, Police Judo offers a new style in the instruction of one of the most well known martial arts. With recreation as the focus of the class, students of all abilities can experience recreational Judo which focuses purely on the execution of good technique, providing a hard but meaningful workout, and giving the opportunity to expand their knowledge of Judo and self-defense in a structured, safe, and supportive environment. 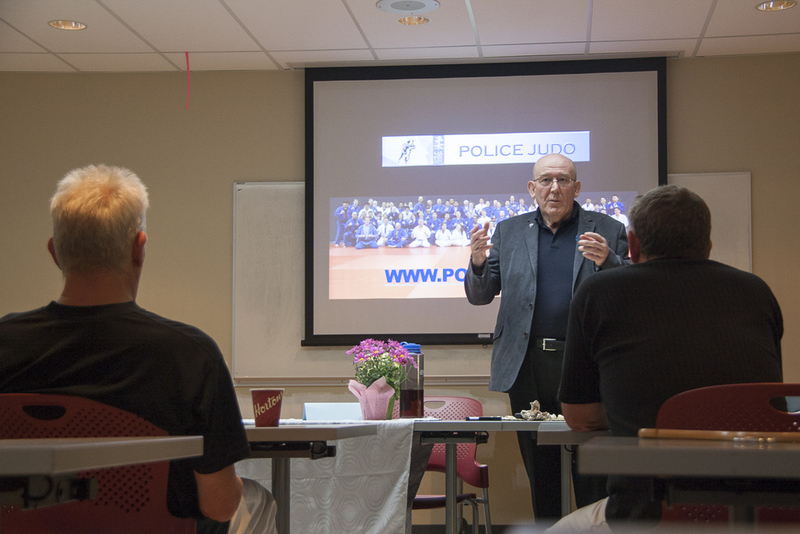 Today, the Police Judo Club has over 250 members in three different clubs throughout the Lower Mainland (Tactical Training Centre in Vancouver, The Justice Institute in New Westminster, Simon Fraser University in Burnaby). From its inception, the Judo Club has maintained a strong relationship with the law enforcement community. Toby Hinton, a longtime police officer with the VPD and the Clubs first black belt, helped secure the Clubs first location and shift the focus of the curriculum from competitive Judo to recreational and law enforcement based control tactics. The Club has also benefited greatly from the continued support and law enforcement experience of VPD veterans Al Arsenault and Mark Steinkampf, as well as Special Constable Chin-I Hsiang, a black belt from Taiwan. Combined, the Club’s instructors have well over a century of Judo and law enforcement experience. To be a part of this growing Recreational and Law Enforcement Judo Club, inquire at www.policejudo.ca. March 23, 2015 by toby hinton. The Police Judo Association has formalized our Association as a registered non-profit society. This move now links all three clubs (SFU Police Judo, the Tactical Training Centre Police Judo, and the Justice Institute Police Judo) under one central Association. Commencing Jan 2015, everyone participating in Police Judo will be required to obtain a membership ($50.00 per year). Membership fees will cover liability insurance for all clubs, equipment costs, and will also assist with the Association operating costs. Although this is an additional charge to students for the Police Judo program, we are maintaining our judo club fees at the current low rates (most inexpensive martial arts program in the Lower Mainland) and now will be providing an additional free practice (open to all members) once a week. We have a highly motivated and knowlegeable Board that will help grow and develop Police Judo over the next few years. We will be updating and revising the website and looking forward to the expanding the Police Judo training locally as well as beyond! There is more to come on this, but it is the first step in our quest to develop and grow the Police Judo program! December 14, 2014 by toby hinton. Congratulations to all of the Police Judo Students who completed the NCCP Theory and Training Course recently held at Tactical Training Centre. The NCCP theory, multiple sport course includes six modules of the introduction to competition and early childhood physical literacy modules. Module topics include ethical decision making process, that is required for all sports, as well as practice planning, seasonal planning, mental training, nutrition, and teaching and learning methods. Adult learning techniques for learning are applied, by the instructor as well as required teaching modules by course participants. Paul B., Clinton S., Danielle S., Olya A, Serguie Z., James Z., Amanda T., Daniel L., Peter C., Jane D., Ingrid C., Ashley F., Juvon P., Julia K., Mark B., Anthony B. , Kyle C. , Rouzbeh B, Ryan K.
November 23, 2014 by toby hinton. Congrats to the following students who graded at SFU Police Judo for the Fall Semester 2014. Great Work! Honorable Mention To Mike Mercado on having the most attendance of any student for this year-to-date (including his volunteer help with the Juniors program). November 16, 2014 by toby hinton. At Police Judo, we believe that the best way to learn how to control the human body is to work with the human body. And if we accept that humans tend to perform the way they train when operating under stress, the type of training Police Judo provides for aspiring law enforcement officers (in whatever capacity be it security, corrections, sherifs, police, etc.) is helping them become best prepared and equipped to place hands on individuals when the situation requires it. There are plentiful opportunities for improving physical conditioning in the Lower Mainland, ranging from Cross-Fit type training to recreational gyms. Being involved in sport or training and getting in peak physical shape is a great asset for policing and at Police Judo we support any effort to maintain a high level of physical conditioning. It is all good. From the pedestrian community centre gym through to the high level jiujitsu program, any time invested into improving physical conditioning (and doing what one likes) is a positive undertaking and will provide good benefit. However, with busy schedules, and limited time, the serious student pursuing a career in law enforcement is best to start training the way they are going to work and learn the most appropriate functional fitness for the unique demands of their job. There are some very athletic and fit people who are spending a lot of time working with one dimensional weights, heavy bags that provide no resistance, hanging from bars that won't hurt them, etc. This is completely different than working at developing appropriate police judo throws, balance dills, footsweeps, break falls, takedowns, limb extraction, two-on-one training, and groundwork drills suitable for policing and self defence using (yes - go figure) a real person. Police Judo is about developing conditioning and fitness as well as a blueprint for proper, ethical use-of-force skills one may need in the field. Being strong and fit is an important part of the equation, but if individuals are assuming that this is a straight translation into a natural skill set for taking an aggressive and combative individual into custody, they may be a little disappointed in how they perform in real life. Can't recall the last time a police officer had a fight with a tractor tire or a kettle bell. Martial arts training that involves working out with other participants needs to be appropriate for the unique demands of the law enforcement (i.e. police officers don't want to be dragging someone to the ground to embark on ground fighting as the ground is not a good place to be for anyone in law enforcement, conversely trying to resolve problems with striking "ground and pound" training is also more than inappropriate). In order to look at the general costing of Police Judo vs. other fitness programs out there, we asked a student to research pricing. Below is the table showing the average costing (these are general snapshots and there may be some variation in pricing for the programming) of various fitness programs in comparison to Police Judo. It should be noted that the JIBC and TTC Police Judo programs run 2x a week for two hour sessions. SFU Police Judo runs 3x a week for two hour sessions. Considering that at any given practice, between the various black belt instructors on the mat, there is usually several hundred years of martial arts experience and decades of operational police experience represented, there is a pretty decent bang for the buck. And why not get in shape learning something that is going to be very practical and useful for a career in law enforcement? August 19, 2014 by toby hinton. A man named Jigoro Kano developed the art of Judo, translated as ‘the gentle way’ or ‘flexible path,’ in Japan near the end of the 19th century. As a rather frail boy of eighteen, he studied various styles of Jujitsu, ‘the gentle art.’ In 1882, a year after his graduation from Tokyo Imperial University, Kano opened a new Dojo. The newly created Kodokan, a word that translates as ‘a school for studying the way,’ began to teach a martial art of Kano’s own devising – Judo. Judo was the embodiment of Kano’s desire to develop a style of unarmed combat with three main purposes: to train the body, to learn to defeat an opponent in combat, and to develop a proper and superior personality. It was not merely a martial art – it was also a sport and a way of life. An open-minded individual, Kano incorporated aspects of Western wrestling along with traditional Jujitsu techniques. A skeptical public soon decided to put Judo to the test by pitting this upstart new martial art against the proven, more traditional art of Jujitsu. In a match held by the Tokyo Metropolitan Police, Kodokan Judo was matched against Totsuka-Ha Yoshin-Ryu Jujitsu; if Judo won, the Tokyo Police would immediately switch their hand-to-hand combat training from Jujitsu to Judo. Kodokan Judo won twelve of the fifteen matches and tied one more, proving itself and ensuring its continued life. In the years that followed, Judo gained in popularity and began to spread. By 1889, Kano, an internationalist and dedicated teacher, decided that the time had come for Judo to spread out from the islands of Japan. He took his first of many trips overseas to bring his new creation to Europe and the United States. Some years later, Judo found its way to the west coast of Canada. In 1923, Steve Sasaki decided something had to be done about Judo in British Columbia. He had grown disgusted with the Judo versus wrestling matches in vogue at the time, seeing them as nothing more than fixed contests. Sasaki had started Judo in Japan at age twelve and was awarded his first-degree black belt, the rank of Shodan, at age seventeen. Determined to promote proper Kodokan Judo in the city of Vancouver, Sasaki spent a year conducting meetings and canvassing the local Japanese Canadian community in order to gauge interest and garner support. Due to his efforts, the first recorded Judo Dojo in British Columbia opened its doors in 1924. The new Judo club was quite successful, and Sasaki’s Dojo soon outgrew its colourful but humble beginnings and moved to Vancouver’s Dunlevy Street in 1925. Sasaki’s early students included both first- and second-generation Japanese Canadians; as these new students gained sufficient training, they began to take their learning and share it with others. By the second half of the 1920s Judo had begun to spread across British Columbia. Many of Sasaki’s students went on to open other clubs in B.C. and received a great deal of help from their former Sensei in this regard. In 1926, Tomoaki ‘Tom’ Doi and Takeshi Yamamoto started a club in Steveston. They quickly turned to the generosity of the Tai-Iku Dojo. Although busy himself, Sasaki visited Steveston twice each week; in fact, the Steveston Dojo eventually became a branch of the Vancouver Dojo. Like Sasaki, Doi ran the Steveston club on a non-profit basis, asking for help from the Japanese Canadian community and even paying expenses himself when needed. More of Sasaki’s friends and students started opening their own clubs elsewhere in the province. Sasaki himself often personally aided in teaching at these new clubs, or – when this was not possible – convinced his assistants to do so. These clubs were often founded in Buddhist churches or Japanese language schools, central gathering spots for B.C.’s Japanese Canadian community. Perhaps Sasaki was, as some have commented, “simply a man of his times, as amateur athletics directed towards the working class were just beginning to percolate through Canada.” However, as the vast majority of Sasaki’s students were Japanese Canadian, it is perhaps more accurate to describe him as a community or cultural activist. In any case, from 1924 to 1932, many young Japanese Canadian men and boys began to learn Judo. Judo training was often done on improvised mats in what were sometimes poor physical conditions for the sport and martial art. Tournaments were held between clubs, and the Judoka – the Judo students – trained hard in order to best represent their Dojo. Many American Judo clubs in the Pacific North-West participated in these tournaments and likewise invited Canadian Judoka to compete south of the border. Through the efforts of Sasaki and his students, Judo began to flourish in many Japanese Canadian communities in British Columbia. After 1932, this growing sport would experience a boost in popularity from two different sources. In the early 30s, a commissioner from the local Vancouver R.C.M.P. detachment attended a February Judo tournament in order to observe the hand-to-hand combat aspect of Judo. Steve Sasaki’s display of the martial art made quite an impression on the R.C.M.P. representative. Soon afterwards, the commissioner contacted Ottawa and requested permission to replace boxing and wrestling training with Judo. However, the R.C.M.P. decided that Sasaki would have to demonstrate the effectiveness of Judo against the local police boxing and wrestling champions. Sasaki, in incredible shape and holding a third-degree black belt at the time, defeated both the boxing expert and the local Mountie wrestling champ. About two weeks later, the Vancouver R.C.M.P. detachment received orders from Ottawa to put Judo instruction among their regular courses, while boxing and wrestling became options. A short time after that, Sasaki opened a Judo Dojo located at the Heather Street Barracks. Eleven officers began training in Judo under Sasaki, with practices held twice each week. In 1934, eleven officers of the R.C.M.P. were awarded the rank of shodan, first-degree black belts – one of the earliest serious involvements of non-Japanese Canadians in Judo. In 1936, another event substantially affected Judo in British Columbia. Jigoro Kano, Judo’s creator, visited Canada for the first time. Returning from the Olympics in Los Angeles, Kano stopped in Vancouver on 17 August 1932 to see the first Canadian Dojo devoted to Kodokan Judo. At the time of Kano’s arrival, Sasaki was in Tokyo training under Kyuzo Mifune, a diminutive Judoka of very high rank who had even competed before the Emperor Hirohito. Because of this, Yoshitaka Mori of the Vernon Dojo had the honour of meeting Kano at the passenger docks. When Kano returned to Vancouver in 1936, however, Sasaki was there to meet him. During this eventful visit, Kano did a great honour to the young Tai-Iku Dojo by renaming it the Kidokan, or ‘house of intrinsic energy.’ He also asked Sasaki to accompany him across North America and Europe in order to help promote Judo. During this trip, Kano told Sasaki how it was important to spread Judo across Canada. This evidently had a great effect on Sasaki, for when he returned to B.C., he made several changes to the Kidokan. He had a dormitory built for the Nisei (second-generation Japanese Canadian) members of the club who lived outside the region. He also developed conversational English classes to help improve the employability of members whose English was weak. In 1938, returning from international Olympic committee meetings in Cairo, Jigoro Kano stopped in Vancouver one final time. A group of young boys from the Kitsilano Judo club assembled at the docks to meet Kano and Sasaki. Unfortunately, this was to be Kano’s last visit to Canada; a painful loss to Judo worldwide, Jigoro Kano passed away on the voyage back to Japan. Though it survived Kano’s passing, Judo in British Columbia nearly disappeared following an even greater tragedy. British Columbia had never had a shortage of anti-Japanese sentiment; however, after the bombing of Pearl Harbor in 1941, public sentiment gave way to a cry for action. Nearly two months later, the Canadian government created a protected area 100 miles wide along the coast of British Columbia which was deemed off-limits to all people of Japanese racial descent. Japanese Canadians west of the Rockies were to be relocated in camps further east in Western and Central Canada. The Judo clubs were perforce shut down as the teachers and students were removed from the protected area. Some of BC.’s Judo instructors, influential community leaders according to a 1942 intelligence report, were among the first to be arrested. This created some interesting confrontations between the police and B.C. Judoka. The Nakashima Judo Club still tells about an incident that took place during these times when Yasumatsu Nakashima, the founder of the club, was about to unload his fish at the dock. He was met by three police officers who attempted to use force rather than reason when they came to seize his boat; they were all rewarded with free swims. Fortunately, this scene was relatively rare; although the Judoka were more than capable of resisting physically, most complied with the demands of their government. Businesses that also housed Judo Dojos were seized and sold as Judoka boarded trains and left for an unknown fate east of the Rockies. The wartime relocation could well have resulted in a permanent end to Judo in British Columbia. However, due to the efforts of Sasaki and his students, as well as to the close relationship Sasaki had forged with the R.C.M.P., Judo did not perish in the internment camps. Although homes, boats, radios, cars, and businesses were seized and sold to fund the relocation process, Judo survived. In the Tashme camp, a family detention camp twenty kilometers north of Hope, Steve Sasaki and Atsumu Kamino continued to teach Judo. Their students were primarily young boys, as men between the ages of 18 and 45 were often sent to work camps to be used as essentially slave labour. With around 2500 internees, Tashme held the largest concentration of Judoka among the three internment camps. Sasaki’s affiliation with the R.C.M.P. served him well in this regard, as the only contacts the internees had with the outside world were R.C.M.P. officers, B.C. Security Commission representatives, and the camp store operator. When Sasaki asked the B.C. Security Commission to allow Judoka to join him at the camp, his request was granted. Although many of the former Judo practitioners were unable to train while labouring elsewhere, Judo was being spread among a new generation of Japanese Canadians. This teaching of Judo was also taking place in the Popoff camp as well as the Angler P.O.W. camp. Genichiro Nakahara of the Chemainus Dojo instructed at Popoff, while Masato Ishibashi and Kameo Kawaguchi taught Judo at the Angler camp. As the Japanese Canadian fishermen and their families returned to coastal B.C., so too returned some of Judo’s early practitioners. Following his stay at Tashme, Steve Sasaki moved to Ashcroft in 1951. It is well known that he taught Judo there and eventually opened a Dojo, although the exact inception date of the club is unclear. The Vancouver Dojo is therefore considered the first coastal Judo club to officially reopen its doors. On the corner of Cordova and Princess, in the old Ukrainian Hall, Tomoaki Doi, Yonekazu Sakai, and Graham Hall – the first Caucasian promoted to black-belt after the war, and the very first Canadian promoted from white belt directly to black – reopened the Dojo. The following year, Sasaki met with Doi to discuss the establishment of a new Judo Dojo in Steveston to replace the one that was abandoned. They called together many the former pre-war practitioners and, as a group, decided to form a new club. As most of the Judoka had no money, there was some difficulty acquiring funding; an interest-free loan from the Japanese Fishermen’s Benevolent Society allowed the Dojo to buy mats and open for business. The instructors were all volunteers, and the club complement at its rebirth, including children and adults, was around 80 members. Other clubs soon followed, and Judo was once again alive on the west coast. Kano’s advice to Sasaki had taken root at last; Judo had spread across Canada and, thanks to the efforts of Sasaki and his students, and once more returned to its Canadian roots on the shores British Columbia. Note: this text is based on an academic essay by David M. Steele, used with permission. All rights reserved. March 16, 2014 by toby hinton. February 24, 2014 by toby hinton. February 23, 2014 by toby hinton. Launa - one of the SFU Junior Judo students - was selected into the BC Winter Games. She won the individual category - silver medal and her Fraser Valley Team won bronze. Lots of young judo players working hard - good job by all! Thanks to all the volunteers and people behind the scenes making it all come together for the young athletes. Launa Hinton on the left. February 22, 2014 by toby hinton.